This is just another DVD affirming Clapton is one of the greatest guitarists in the world, of all genres. Not to mention his soulful honeysuckle voice. The man is a master of his art ! Second to none ! I've followed Clapton since the 60's I first saw him with Cream in South Bend Indiana at Stepin Center at the University of Notre Dame and have travelled to see his concerts every couple years ever since. By far my favourite and he only gets better with age. Clapton might not be God as was said during the 60's. But he's one heck of a messenger !!! This was the DVD that pushed me to the edge. I am now a complete EC addict. Other music doesn't even appeal to me. My Fathers Eyes is a song that has a very moving and emotional intro (about 1 min 15 sec) that pulls at ones heartstrings. I believe the best portion of this whole DVD would be this intro. Dulcet and calming tones lead to a powerful upbeat bright song. The closing solo on MFE happens to be well, the only downside is that it doesn't go on forever. Over the Rainbow does the same. Both beautiful songs. It is hard to believe that such a simple object such as a guitar can make beautiful notes. I became a fan watching this free concert in Dec 02 on Direct TV. I love this DVD and Unplugged both equally. I love the guitar work. It's so nice to see the solo's up close. Excellent camera work. Since I've only been a fan since December I'm still in the process of collecting CD's and DVD's. It's become a fun and exciting hobby (spell that obsession). Any suggestions about books to read etc? I would love to see him in person I know he's been to Tucson, AZ before I'm praying for a return visit. 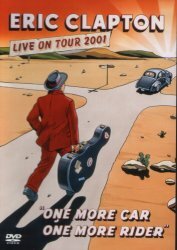 Excellent show and performance from Eric and the band, BUT.... how about some extras on this DVD? An interview, some rehearsal footage, tour itinerary, backstage footage, decent bio etc. Compared to other artists DVD'S that I have, One More Car is sadly lacking. It's fine for EC'S die hard fans (like me) but I do get a sense that there is a sense of complacency in Eric's camp and that whatever is released will sell the required amount...One can only hope that this will be rectified on future releases. The DVD is excellent! A must have. Great camera work and excellent close-up shots in EC's solo's... it's worth having just to see "My Father's Eyes" and "River Of Tears" alone! I'm a bit puzzled about the last review regarding "you can hardly hear Eric's guitar work" as I have no problems! This DVD is amazing great songs, solos and band the sound is ok, but you can hardly hear Eric's guitar work and "Over The Rainbow" is a good ending to the DVD. Thanks Eric!